← HYPOCRISY WON BIG IN SOUTH CAROLINA! 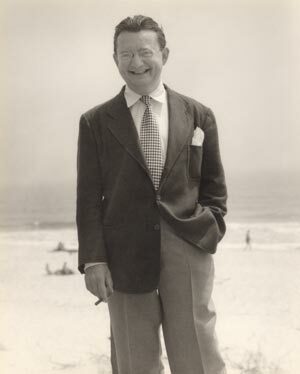 A LONG-OVERDUE TRIBUTE TO I. F. STONE! May 12, 2013 By Jack Jodell. 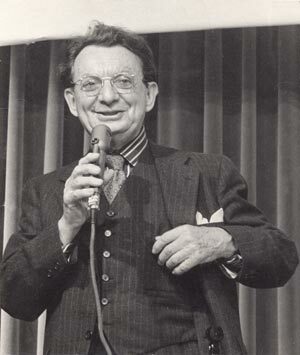 A voice rarely mentioned anymore, yet nonetheless tremendously influential during that fabulous liberal era of the mid-1950s to the early 197os , was that of Isidor (Izzy) Feinstein Stone, better known as I. F. Stone. During that great time, this iconic man rose to promimence as the originator of the tremendous publication I. F. Stone’s Weekly. This great digest was once ranked by his fellow journalists as 16th on the list of “Tthe Top 100 Works of Journalism in the United States in the 20th Century.” A thorough look through his website will show you why this was so. I strongly urge you to check it out at http://ifstone.org/! Mr. Stone was a brilliant investigative journalist and worked for The New York Post, The Nation, and other sources in the mainstream media until he was blacklisted during the horribly excessive McCarthy era of the early 1950s. He began his own publication as a result of that blacklisting. Like many leftists of his day, he was accused by the paranoid far right of having Soviet ties. The allegations have never been solidly proven, and he made a decisive break with Soviet-style communism when Russia invaded Czechoslovakia in 1968 anyway. Regardless, Stone proved to be a thorn in the side of the establishment (especially conservatives) ever afterward. Paranoid FBI Director J. Edgar Hoover even placed him under surveillance for many years. I have reprinted his story below, in his very own words, taken directly from his abovementioned website. This man was truly one of a kind , and I sincerely hope we will be lucky enough to see a journalist of his caliber arise again before long! For the world desperately needs more I. F. Stones, and, regrettably, we haven’t had one since his death way back in 1989. Check out that website, and you’ll see what I’m talking about! I am, I suppose, an anachronism. In this age of corporation men, I am an independent capitalist, the owner of my own enterprise, subject to neither mortgager or broker, factor or patron. In an age when young men, setting out on a career of journalism, must find their niche in some huge newspaper or magazine combine, I am a wholly independent newspaperman, standing alone, without organizational or party backing, beholden to no one but my good readers. I am even one up on Benjamin Franklin—I do not accept advertising. The pieces collected in this volume are from a four-page miniature journal of news and opinion, on which I have been a one man editorial staff from proofreader to publisher. This independence, like all else, has its price—the audience. My newspaper reaches a relative handful, but the 5,000 readers with whom I started have grown to more than 20,000 in ten years. I have been in the black every one of those ten years and paid off the loans which helped me begin, without having had to appeal to my readers or to wealthy friends to keep going. I pay my bills promptly, like a solid bourgeois, though in the eyes of many in the cold-war Washington where I operate I am regarded, I am sure, as a dangerous and subversive fellow. 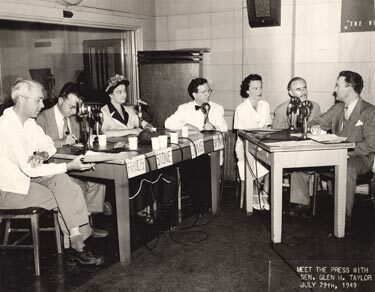 Izzy, age 40, appearing on Meet The Press, July 29, 1949. Once before a newspaperman successfully attempted this same experiment in independence. My predecessor was a distinguished foreign correspondent and crusading liberal journalist, George Seldes. His four-page paper, In Fact, published much that was brushed under the rug by the conventional press. But Mr. Seldes had the advantage of publishing in a kind of Popular Front in the late ‘30s and the early ‘40s when there were powerfully organized left-wing unions and organizations ready to take bulk subscriptions to a maverick publication (though the dangers in such support were demonstrated when it was withdrawn from Seldes after he backed Tito in his fight with Stalin) . I, on the other hand had the disadvantage of starting my paper in January 1953 when McCarthy and McCarthyism were in the ascendant. That very month the unscrupulous Wisconsan had become chairman for the first time of the Senate Committee which he used to terrorize the left of center, the Eisenhower Administration and even his own Senate colleagues. There could not have been a less propitious time to launch a radical paper, fighting the witch hunt and the cold war. In these essays collected from its pages one may savor again the full flavor of those haunted years. Izzy, about age 40, on Fire Island where the Stones summered from 1945 on for a few decades. I have been a newspaperman all my life. In the small town where I grew up, I published a paper at fourteen, worked for a country weekly and then as correspondent for a nearby city daily. I did this from my sophomore year in high school through college, until I quit in my junior year. I was a philosophy major and at one time thought of teaching philosophy, but the atmosphere of a college faculty repelled me. While going to college l was working ten hours afternoon and night doing combination rewrite and copy desk on the Philadelphia Inquirer, so I was already an experienced newspaperman making $40 a week—big pay in 1928. I have done everything on a newspaper except run a linotype machine. I had become a radical in the ‘20s while in my teens, mostly through reading Jack London, Herbert Spencer, Kropotkin and Marx. I became a member of the Socialist Party and was elected to the New Jersey State Committee of the Socialist Party before I was old enough to vote. I did publicity for Norman Thomas in the 1928 campaign while a reporter on a small city daily, but soon drifted away from left-wing politics because of the sectarianism of the left. Moreover, I felt that party affiliation was incompatible with independent journalism, and I wanted to be free to help the unjustly treated, to defend everyone’s civil liberty and to work for social reform without concern for leftist infighting. I was fortunate in my employers. I rarely, if ever, felt compelled to compromise with my conscience; even as an anonymous editorial writer I never had to write something I thought untrue. I worked for a succession of newspaper people I remember with affection: J. David Stern and his editor Harry T. Saylor on the Camden Courier Post, the Philadelphia Record and the New York Post; Freda Kirchwey of The Nation; Ralph Ingersoll and the late John P. Lewis of the newspaper PM; the late Bartley Crum and his editor Joseph Barnes of the short-lived New York Star; and Ted O. Thackrey of the New York Post and the New York Daily Compass. Working for them was a wonderfully rewarding experience and I learned much from all of them. From 1932 to 1939 I was an editorial writer on the Philadelphia Record and the New York Post, then strongly pro New Deal papers In 1940 I came to Washington as Washington Editor of The Nation and have been here ever since, working as reporter and columnist for PM, the New York Star, the New York Post (for a short interval) and the New York Compass. When the Compass closed in November 1952 and no congenial job seemed likely to open up, I decided to launch a four-page weekly newsletter of my own. 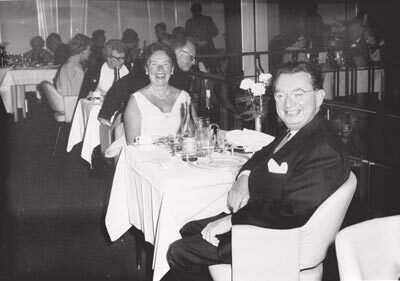 Esther’s father, Morris Roisman (left) and Izzy’s father, Bernard Feinstein (right), standing behind I.F. 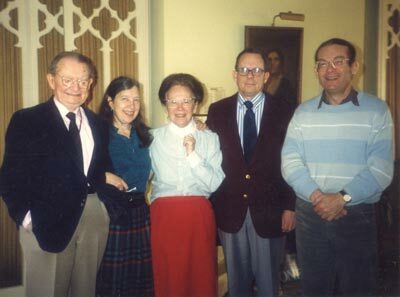 Stone’s children, Celia, Christopher and Jeremy with the shortest child being cousin Michael Boudin, elder son of Esther’s sister Jean. I succeeded because it was what might be called a piggy-back launching. I had available the mailing lists of PM, the Star and the Compass and of people who had bought my books. For a remarkably small investment, in two advance mailings, I was able to get 5,000 subscribers at $5.00 each. I was my own biggest investor, but several friends helped me with loans and gifts. The existence of these highly selective mailing lists made it possible to reach what would otherwise appear to be needles in a haystack—a scattered tiny minority of liberals and radicals unafraid in McCarthy’s heyday to support, and go on the mailing lists of, a new radical publication from Washington. I am deeply grateful to them. It speaks well for the tradition of a free press in our country that even in the heyday of McCarthy it was possible for me to obtain my second-class mail permit without trouble. I had then been working in Washington for 12 years as correspondent for a succession of liberal and radical papers. 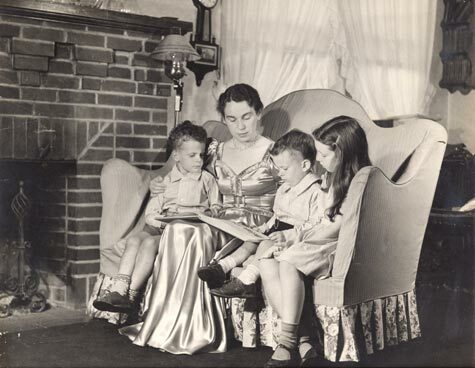 I had supported Henry Wallace in 1948. I had fought for the civil liberties of Communists, and was for peace and coexistence with the Soviet Union. I had fought the loyalty purge, the FBI, the House Un-American Activities Committee, and McCarran as well as McCarthy. I had written the first magazine article against the Smith Act when it was first used against the Trotskyites in 1940 There was nothing to the left of me but the Daily Worker. Yet I was able to get second-class mail privilege without a single political question. As George Seldes had before me, I encountered old-fashioned civil service courtesy and political impartiality in the post office and the second-class mail privilege when I started was my bread and butter. The difference between the second-class rate and the cheapest third-class rate was the equivalent of my salary. My idea was to make the Weekly radical in viewpoint but conservative in format. I picked a beautiful type face, Garamond, for my main body type, and eschewed sensational headlines. I made no claim to inside stuff—obviously a radical reporter in those days had few pipelines into the government. I tried to give information which could be documented so the reader could check it for himself. I tried to dig the truth out of hearings, official transcripts and government documents, and to be as accurate as possible. I also sought to give the Weekly a personal flavor to add humor wit and good writing to the Weekly report. I felt that if one were able enough and had sufficient vision one could distill meaning, truth and even beauty from the swiftly flowing debris of the week’s news. I sought in political reporting what Galsworthy in another context called “the significant trifle”—the bit of dialogue, the overlooked fact, the buried observation which illuminated the realities of the situation. These I often used in “boxes” to lighten up the otherwise solid pages of typography unrelieved either by picture or advertising. I tried in every issue to provide fact and opinion not available elsewhere in the press. In the worst days of the witch hunt and cold war, I felt like a guerilla warrior, swooping down in surprise attack on a stuffy bureaucracy where it least expected independent inquiry. The reporter assigned to specific beats like the State Department or the Pentagon for a wire service or a big daily newspaper soon finds himself a captive. State and Pentagon have large press relations forces whose job it is to herd the press and shape the news. There are many ways to punish a reporter who gets out of line; if a big story breaks at 3 A.M., the press office may neglect to notify him while his rivals get the story. There are as many ways to flatter and take a reporter into camp—private off-the-record dinners with high officials, entertainment at the service clubs. Reporters tend to be absorbed by the bureaucracies they cover; they take on the habits, attitudes and even accents of the military or the diplomatic corps. Should a reporter resist the pressure, there are many ways to get rid of him. If his publisher is not particularly astute or independent, a little private talk, a hint that the reporter seems irresponsible—even a bit radical—“sometimes one could even mistake him for a Marxist”—will do the job of getting him replaced with a more malleable man. But a reporter covering the whole capital on his own—particularly if he is his own employer—is immune from these pressures. Washington is full of news—if one story is denied him he can always get another. The bureaucracies put out so much that they cannot help letting the truth slip from time to time. The town is open. One can always ask questions, as one can see from one of my “coups”—forcing the Atomic Energy Commission to admit that its first underground test was detected not 200 miles away—as it claimed—but 2600 miles away. This is the story of how I got that story—one example of what independent news gathering can be like. Izzy and Esther with children Celia, Jeremy and Christopher from left to right in December 1988. The first underground test was held in the fall of 1957. The New York Times report from the test site in Nevada next morning said the results seemed to confirm the expectations of the experts: that it would not be detected more the 200 miles away. But the Times itself carried “shirttails” from Toronto, Rome, and Tokyo saying that the shot had been detected there. Since the experts (viz. Dr. Edward Teller and his entourage at Livermore Laboratory, all opposed to a nuclear test ban agreement) were trying to prove that underground tests could not be detected at a distance, these reports from Toronto, Rome and Tokyo piqued my curiosity. I did not have the resources to check them by cable, so I filed the story away for future use. Next spring, Stassen, then Eisenhower’s chief disarmament negotiator, testified before the Humphrey Disarmament Subcommittee of the Senate that a network of stations a thousand kilometers (or 580 miles apart) could police a nuclear test ban agreement and detect any underground tests. Two days after his testimony the AEC issued its first official report on the Nevada explosion for publication the following Monday. This said that the Nevada underground explosion had not been detected more than 200 miles away. The effect was to undercut Stassen’s testimony. If the Nevada blast could not be detected more than 200 miles away then a network of stations 580 miles apart would not be able to police an agreement. I recalled the New York Times report of the previous fall, dug it out of a basement file and telephoned the AEC press office. I asked how the AEC reconciled its statement in the report about to be released that the blast was not detected more than 200 miles away with the reports from Rome, Tokyo and Toronto the morning after that it had registered on seismographs there. The answer was that they didn’t know but would try to find out. No bureaucracy likes an independent newspaperman. Whether capitalist or communist, democratic or authoritarian, every regime does its best to color and control the flow of news in its favor. There is a difference here and I’m grateful for it. I could not operate in Moscow as I do in Washington. There is still freedom of fundamental dissent here, if only on the edges and in small publications. 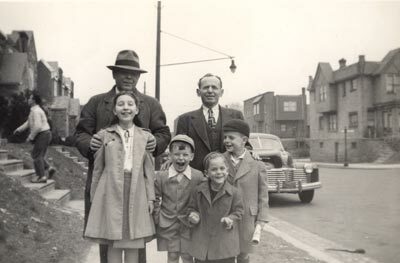 Esther with children Jeremy (6 years old), Christopher (4 years old) and Celia (9 years old) in 1941 at 5618 Nebraska Avenue, N.W., Washington, D.C. The fault I find with most American newspapers is not the absence of dissent. It is the absence of news. With a dozen or so honorable exceptions, most American newspapers carry very little news.Their main concern is advertising. The main interest of our society is merchandising. All the so-called communications industries are primarily concerned not with communications, but with selling. This is obvious on television and radio but it is only a little less obvious in the newspapers. Most owners of newspapers are businessmen, not newspapermen. The news is something which fills the spaces left over by the advertisers. The average publisher is not only hostile to dissenting opinion, he is suspicious of any opinion likely to antagonize any reader or consumer. The late Colonel McCormick, in his Chicago Tribune, ran a paper about as different as possible from mine in outlook. But I admired him. He stood for something, he was a newspaperman, he gave the Tribune personality and character. Most U.S. papers stand for nothing. They carry prefabricated news, prefabricated opinion, and prefabricated cartoons. There are only a handful of American papers worth reading —The New York Times, The St. Louis Post-Dispatch, The Washington Post, The Washington Star, The Baltimore Sun, The Christian Science Monitor—these are news papers in the real sense of the term. But even here opinion is often timid; the cold war and the arms race are little questioned though these papers do speak up from time to time on civil liberty. There are only a few maverick daily papers left like the York (Pennsylvania) Gazette and Daily and the Madison (Wisconsin) Capital Times. All this makes it easy for a one-man four-page Washington paper to find news the others ignore, and of course opinion they would rarely express. 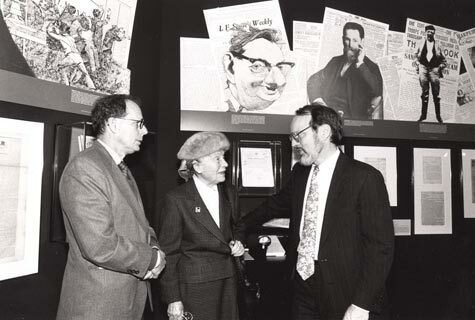 Esther and Jeremy at a 1990 Library of Congress exhibit, “The American Journalist: Paradox of the Press,” with Loren Ghiglione, guest curator of the exhibit. For me, being a newspaperman has always seemed a cross between Galahad and William Randolph Hearst, a perpetual crusade. When the workers of Csespel and the 1956 Hungarian Revolution put a free press among their demands, I was thrilled. What Jefferson symbolized for me was being rediscovered in a socialist society as a necessity for good government. I believe that no society is good and can be healthy without freedom for dissent and for creative independence. I have found among the new Soviet youth kindred spirits in this regard and I watch their struggle for freedom against bureaucracy with deepest sympathy. I am sorry, when discussing our free press with them, to admit that our press is often almost as conformist as theirs. But I am happy that in my own small way I have been able to demonstrate that independence is possible, that a wholly free radical journalist can survive in our society. In the darkest days of McCarthy, when I often was made to feel a pariah, I was heartened by the thought that I was preserving and carrying forward the best in America’s traditions, that in my humble way I stood in a line that reached back to Jefferson. These are the origins and the preconceptions, the hopes and the aspirations, from which sprang the pieces that follow. This entry was posted in capitalism, commentary, Politics, Uncategorized and tagged blacklisting, censorship, corporatism, I. F. Stone, I. F. Stone's Weekly, McCartha era, Meet the Press, oppression, Socialism, Socialist Party, The Nation, The New York Post. Bookmark the permalink. 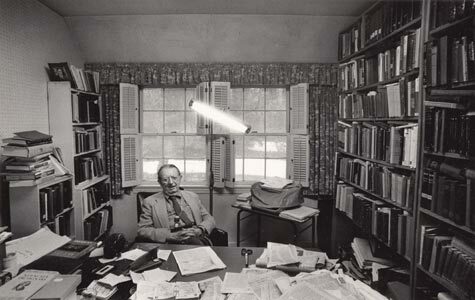 5 Responses to A LONG-OVERDUE TRIBUTE TO I. F. STONE! Hey Jack, I worshiped Izzy Stone back in college in the 70’s.There’s a 1973 documentary everyone should check out sometime. I F Stone’s Weekly. I am really not sure it’s even available on DVD or anything, but if you find it, you’ll see the story of an American hero! Great post again! Thanks for what you write. I need to change the date of our outing because Ry and Angie would like me to watch Ryker on Friday, May 17th. Sorry to have to switch. Could we go to the same seafood place on Friday the 24th same time, or some other day? I.F. 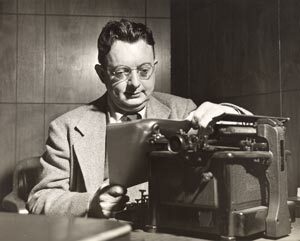 Stone is regarded as having surpassed him, but George Seldes, from 1940 to 1950, was the trailblazer, reporting on stories that advertising-addicted mass media wouldn’t. The cigarette industry in particular hated Seldes. He was the only journalist out there who was linking cigarette smoking with premature death. Now, of course, that’s common knowledge. But back when half the adult population of the U.S. was smoking cigarettes, they were very protective of their profits and despised Seldes. Thank you, Manifesto Joe, for the info on Seldes. I will research him for a later blog.